SchoolReach, a provider of notification systems, has launched its new Community App solution, which is designed to help schools create custom-branded iPhone and Android apps. Customized apps can include modules such as school calendars, staff directories, homework info, lunch menus and social media accounts. Using a secure app management website, school personnel (including teachers) can add, remove or edit content from their apps at any time, as frequently as they choose. 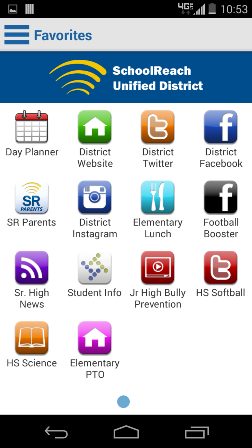 School leaders can download a demo version of the SchoolReach Community App by visiting the iTunes Store and downloading the SR Unified District app or visiting Google Play and downloading the SchoolReach Unified District app. The Calendar allows users to choose school-level or activity calendars and favorite the content with color coding. The Favorites feature gives users easy access to their favorite content sources. The Contacts feature allows anyone with the app to quickly connect with teachers and administrators. Users can choose custom imagery, including custom app launch icons and in-app branding. Users can sign up for a live demo of both the app and the management website here.